Ella was born into water at home on the 3rd of May 2010, first child of Joe and Justyna Ella was beautiful and seemed perfect in every way. But after 4 months she was diagnosed with SMA Type 1 after concerns about the lack of movement in her legs. Despite Ellas diagnosis she had many months of great health free from infections and other problems. Rather than getting weaker as we expected it seemed that Ella was getting stronger each month and progressing, putting on weight, moving onto eating solids and developing despite the obvious limitations in her movement. She was a very happy child who put a smile on everybody's face, she loved to laugh, play, babble and watch her favourite Cbeebies shows. We enjoyed many trips with Ella to parks, gardens, zoo's and many other places. We were fortunate that she was so well for so long that we were able to fly abroad several times to visit family. Unfortunately though Ella’s good health wouldn't last forever and 1 month before her first birthday Ella was taken to hospital after having breathing difficulties related to her secretions. After being on oxygen for several hours and given antibiotics we were sent home the same day. Ella fought a small infection and after a few days at home was back to her normal self, but the event seemed to have weakened her physically and she was struggling with her swallowing. This led to her having an NG tube put in to help her feed. The following weeks were great and although Ella had to be suctioned more often and we had started using a nebulisor to help break down her secretions, she seemed to have picked up in strength and power as she was getting enough nutrition at regular times due to the NG tube feeding. 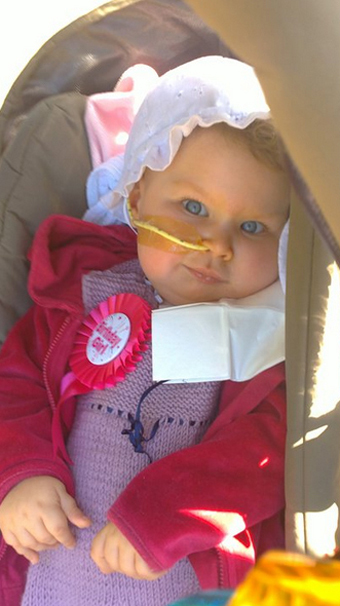 Ella was as happy as ever and so were her family, this culminated in her first birthday, a point we thought we might not reach upon initial diagnosis. We celebrated with a small birthday party with family and friends at home with lots of presents, balloons and fun. It was a very proud and happy day for all. Unfortunately though Ella found it more and more difficult to manage her secretions and on the 29th of may Ella passed away with her parents beside her. She had been too weak to fight a 2nd chest infection she had caught after struggling with a small cough for a few days. She passed away peacefully and in a dignified way aged 1 year 3 weeks and 5 days. If you would like to donate to Ella's Butterfly Fund please click here.